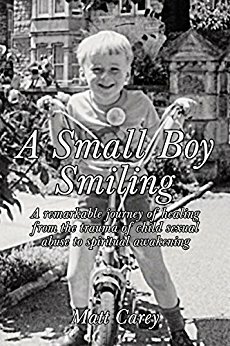 shares with us in this article what it was like to write "A Small Boy Smiling," a journey of deep pain, but also of hope and courage. Finally, I have written my story in the hope that fellow survivors of sexual abuse, of which there are estimated to be well over a million in the UK alone, might find encouragement and strength to get the help they desperately need to heal. I am very grateful to Sarah Paton Briggs, my psychotherapist, who has written a later chapter, Soulful Space: Reflections On My Therapy Work With Matt. Sarah brings her considerable expertise and offers a professional perspective to my journey of healing, therapy options, and practical advice to fellow survivors of sexual abuse who may be considering professional therapy. A close friend (a clinical psychologist, CSA survivor, and a recovering alcoholic), who has supported me throughout my recovery suggested I provide a description of the psychological and emotional process I went through to get the memories of the abuse from the mind to the page. She told me that when she read the abuse chapter, she sensed that I had dissociated from the trauma, which is true; I didn’t think I'd last five minutes without breaking down. During a traumatic event and throughout the emotional upheaval that often follows, dissociation is one of the mind's most common coping mechanisms in response to feeling a sensation of threat or danger. Dissociation covers a wide variety of experiences, from mild detachment to a complete disconnection from all conscious physical and emotional experiences. It is also a common symptom of Complex PTSD. Whilst I had spoken about the abuse in therapy for many years, writing everything I could remember about what happened made it feel so much more real, and this horrified me. To be able to get it on paper, I decided I had to deliberately suppress all my emotions, as I describe below. I'm not suggesting this is the best way to do it, but it was the only way I could find to be as brutally honest as I have been, dealing with the day-to-day challenges of living with Complex PTSD. PTSD is a psychiatric disorder that may develop after exposure to a terrifying event or ordeal in which severe physical harm occurred or was threatened. Traumatic events that may trigger PTSD include sexual and physical assaults, natural or unnatural disasters, accidents, or military combat. The term PTSD was first used by veterans of the Vietnam War, but the problem has existed for a lot longer and has had a variety of names, including shell shock, battle fatigue, combat stress, and post-traumatic stress syndrome (PTSS). One of the symptoms of PTSD is that I often go into shock as the memories come up, and whilst I feel hyper-vigilant and very anxious as soon as I have been triggered, there is delayed reaction to my feeling the intensity of the anger, shame and guilt until later that day. The challenge was to focus all my attention on the writing whilst doing my best to ignore the emotional trauma that was building up inside of me. As I contemplated making a start, I felt the trauma had been triggered in my mind, and under my skin (the symptoms included physical tension in the groin and lower back, nausea in the stomach, and pain behind my eyes); mentally I knew I was very fragile. I knew this was an inevitable consequence of confronting my painful memories, and that I'd have to accept and work through them as best I could. I feared that if I attempted to write on my own, the shame and rage would attack me, and I wouldn't be able to get very far with the written work. It was also important to me that my new flat felt like a safe place, which hadn't been contaminated by memories of the abuse. As odd as it may seem to some (but for me to feel more able to suppress the emotions and get everything I could remember on paper), I decided to write down the memories in several cafes across central and north London over a period of six months. I wrote brief notes which gradually became sentences, which were then revised to become paragraphs and a chapter, and which were eventually sent to my editor, Tom Bartlett, for editing. Being in a public place, and having pride and an ego, helped to suppress the negative emotions, so I could ‘get the job done’. I followed a schedule of an hour of writing, and then I went to an AA meeting, or for a long walk in Regents Park or across Hampstead Heath, during which time I'd feel the shock, and the shame, and rage come up, and during this I'd practice some helpful concentration techniques to make sure I didn’t fully dissociate. Depending how I felt, I'd force myself to do at least three hours of writing about the abuse for two days each week, and then I'd leave it to focus on another chapter. After some writing sessions, I felt I might lose consciousness. Whilst I didn't have any physical warning (unlike with a panic attack, I didn’t have any palpitations, or shortness of breath), I'd suddenly feel very light-headed and my vision would become slightly impaired. If I was out walking, I would immediately find a wall or bench and hold on tight to keep myself bodily conscious until the experience had passed. I avoided traveling on the Underground when I felt like this, and walking near traffic, just in case my legs did give way. (There were several occasions when the flashbacks to the abuse, and the shame I felt, made me feel suicidal; I didn’t trust myself when it felt like this, and so there was another reason to avoid taking the Underground). The sensation was as if I'd had a sudden rush of oxygen to the brain. Perhaps it was that the writing had released a great deal of energy which had been locked into the memories. Later in the evening, the suppressed emotions (the shame, rage, and sometimes the tears) would finally hit me, and I would make sure I was in a safe place, which was preferably at home. I felt so desperately vulnerable at this point, I couldn't handle anyone else seeing me like this. The whole process of writing the chapter about the abuse was mentally, physically and emotionally exhausting, but it has certainly helped me to release so much of the shame and rage. From start to finish, it took eleven months to write that one chapter. I do hope my story might offer some encouragement on your healing journey. It has been hugely important for me to know that I am not alone, and that there are professional organisations, charities and voluntary groups offering support. The book also includes a chapter written by my trauma therapist Sarah Paton Briggs, called Soulful Space: Reflections On My Therapy Work With Matt, which is offered as a free download from my website. I invited Sarah to pull back the curtain of client/therapist confidentiality and write a chapter about my therapy sessions with her from the therapist’s perspective. The chapter offers a professional perspective to his journey of healing, therapy options, and practical advice for survivors of sexual abuse who may be considering professional therapy. I welcome comments and feedback, in particular from fellow survivors, educators and mental health professionals. Please feel free to contact me via www.mattcareybooks.com.